Since forming a few years ago, The Rubys are quickly becoming a popular corporate act both locally and interstate. The talented trio namely Betty Samis, Rita Pastore and Leah Tregenza share one common interest – a love of 60’s music that includes the likes of The Supremes, The Shangri-Las, The Ronettes, The Crystals, Dusty Springfield and Lulu. The trio pay a colourful and moving tribute to the 60’s era recreating the look and sound of the girl group pop phenomenon with dazzling costumes, iconic dance moves, sweet harmonies and catchy melodies. From Adelaide to Melbourne, Darwin to Cairns, The Rubys are not just a hit with older audiences, but to a younger generation as 60’s hits are covered by artists of today – such as the late Amy Winehouse, Kylie Minogue and the cast of Glee. 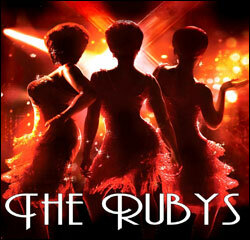 Recently, movies such as The Dreamgirls and the Sapphires have renewed interest in the girl groups of the 60’s. Overall, the 60’s girl groups had a profound influence on pop/rock and British invasion acts like the Beatles. Their songs celebrated female desire with lyrics innocent and yearning. The Rubys also pay tribute to artists who emerged decades later, but were undoubtedly influenced by those groups including The Pointer Sisters, Spice Girls, Tina Turner, The Weather Girls and Stars on 54. As individual performers, Rita is the other half of acoustic duo Blush, Betty sings in Santorini Greece in the summer, and is part of the children’s group The Buzzies, and Leah is a popular choice for Australia’s National Anthem, singing at major events such as The Tour Down Under and The Slowdown. The Rubys have performed at the the Variety Night in Paris Ball, Novita River Run, SA Variety Bash, Camp Quality Cherry Ball, Crows Ruby ladies luncheon, Adelaide and Melbourne Boat Show breakfasts, Brothers Leagues Club Cairns Qld, Rundle Mall Spring Summer fashion parades, and the 2011 and 2012 Christmas seasons at the Morphettville Racecourse. The Rubys were also invited to take part in the Woolworths Carols By Candelight at Elder Park, December 2012. Betty has many years experience in the entertainment industry, fronting various cover bands and touring with the Tina Turner Tribute Show. She moved to Queensland performing at Dunk Island resort before settling in FNQ to take on a variety of roles within the media, breakfast co-host, radio talkback producer, and entertainment reporter for Channel 10. She made history as part of the new breakfast crew when SEAFM was launched in Cairns. Her theatre credits include Mary Magdeline in Jesus Christ Superstar, Katisha in the Hot Mikado, Lucy in Cosi, Sonia in Godspell, and Star Ovgrez in Waiting for Botox at the 2009 Adelaide Fringe, where the show received an ATG nomination for best professional comedy. She has until recently been part of the girl group Motown Dream and Sonnet. With a natural ability to entertain children, she’s a presenter with kids group “The Buzzies”. Her passion for entertainment has her freelancing as a entertainment correspondent on radio FIVEaa and has recently joined the TV show “The Court of Public Opinion” with host Jeremy Cordeaux reporting on entertainment news.Betty is also a regular at Carols By Candlelight at Elder Park. Teaming up with Leah and Rita, she is excited to bring this show to audiences. Leah is a highly entertaining and versatile vocalist who has developed her stage craft over many years performing for Adelaide audiences. Her warmth, energy and powerful voice blends in wonderfully with the other Ruby girls. She has inherited vocal qualities from her aunt Julie Anthony. An impressive performing background including popular bands Planet Square (Penelope Heartstop) Flirt and Chocolate. She has appeared at Carols By Candlelight Elder Park as well as singing the anthems for the 2010 and 2011 Tour Down Under. Rita will stun you with her powerful vocals and magical stage presence. She is trained in voice, classical, jazz, tap dance and acting making her an all round entertainer. She has performed overseas in lavish Vegas shows and as a children’s presenter with Disney. Locally, Rita has performed in theatre shows, “The Fabulous Follies” “Up Your Toga” “Diamond Lils” and “Rock n Roll Reunion”. Rita is a passionate performer and fits in perfectly with The Rubys. She also performs in a duo called Blush.